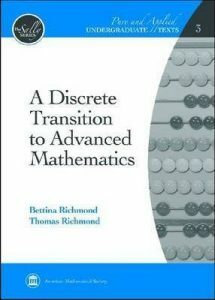 The required textbook for this class is A Discrete Transition to Advanced Mathematics, by Bettina and Thomas Richmond. 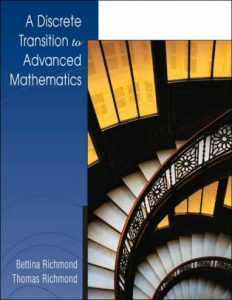 This book is available in an old edition published by Thompson/Brooks-Cole and in a new edition published by the American Mathematical Society. These editions are essentially identical, so please feel free to purchase either one. If your textbook order is delayed during the first week of class, then you can download a PDF of the first two sections from the class Canvas site (used here only to protect the distribution of this copyrighted material). If your textbook order is delayed more than a week, then you’ll have to make friends with someone who is willing to share their book with you until your copy arrives! Hello and welcome to Math 245! We won’t be using Canvas for this course, except perhaps to post some mid-semester grades. Check out the resource links on the right for more information about the class. Hello and welcome! This is the main website for MATH 245-03. Click on the title or the Announcements link for mid-semester updates, or check out the class resources and links below. You can also email the professor at taalmala@jmu.edu, but Slack is better!